It doesn’t take much of an internet search to discover the “fact” that the Goddess Isis bore the Holy Child Horus on December 25th. Frequently, the statement is used to dismiss the Christian tradition of the birth of the Christ on that day (and by inference, Christian tradition in general) as “mere Pagan superstition.” Frankly, this has been driving me a little crazy for years—for a variety of reasons. First, there is absolutely nothing wrong with celebrating the birth of Jesus Christ, the bringer of the light of Christianity to its believers, at that time of year when the light of the sun begins its return to the world. It is the perfect symbol and early Christians would have been silly to ignore it. Well, it finally bothered me enough that I decided to find out where that whole Horus-born-on-December-25th thing came from. So this was an Egyptian tradition at least from the time of Plutarch. But was it so earlier? Well, I’m still looking into that. (Please see the Addendum at the end of this post.) But at least one author has noted that in the time of Pharaoh Amenemhet I (approx. 1991-1962 BCE), the pharaoh took a new title as the sun approached winter solstice in the 17th year of his reign. The title was Nem-mestu, Repeater of Births, a title also given to the dead and which may refer to daily solar rebirth or even to reincarnation. 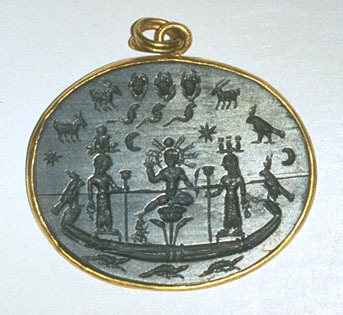 In addition to the normal pharaoh-sun connection, the king is even more strongly associating himself with the sun by taking the title, and it would seen from the timing that he is particularly associating himself with the winter solstice sun. At the very least, this points to the importance of the winter solstice to Egyptian tradition. 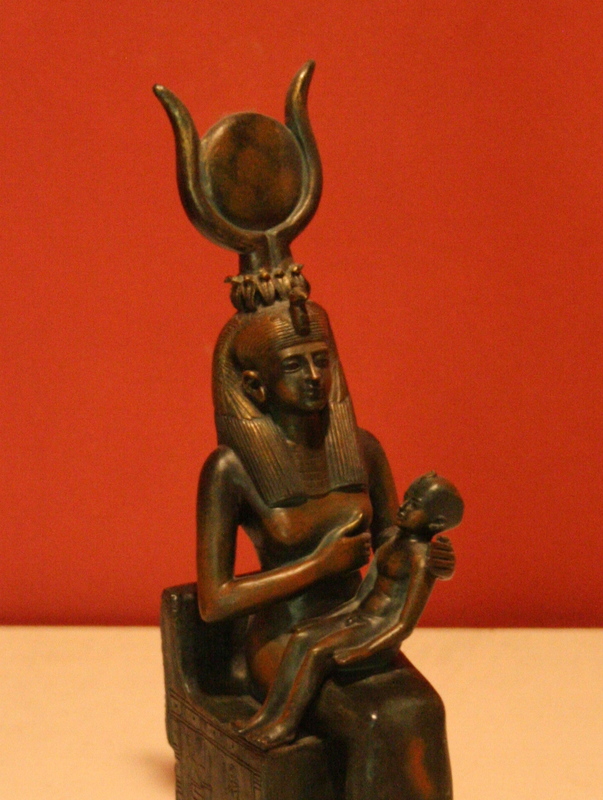 On this protective amulet, Isis & Nephthys guard the shining solar child, Horus. Okay, so we have the solar Holy Child’s birth at or around the winter solstice. Makes perfect sense. But what about that December 25th date? Well, you see, the Roman calendar went through a certain amount of upheaval and—bottom line—December 25th was considered the “traditional” date of the winter solstice, even if that was off from astronomical solstice. (If you want to calendar geek on that, check this out or this.) We have from a number of sources, including Epiphanius, that “the eighth before the Kalends of January” was considered to be the winter solstice. (Epiphanius, Panarion, 22,3) Because of the inclusive way the Romans counted, this “eighth before the Kalends” was December 25th. Another interesting thing about the choice of December 25th is that—even just those few days after the astronomical solstice—you can begin to see that the light is indeed returning. Some scholars have suggested that the December 25th date for the solstice reflects this perceivable change, so that even though the exact moment of astronomical solstice is prior to the 25th, it becomes noticeable about the 25th. 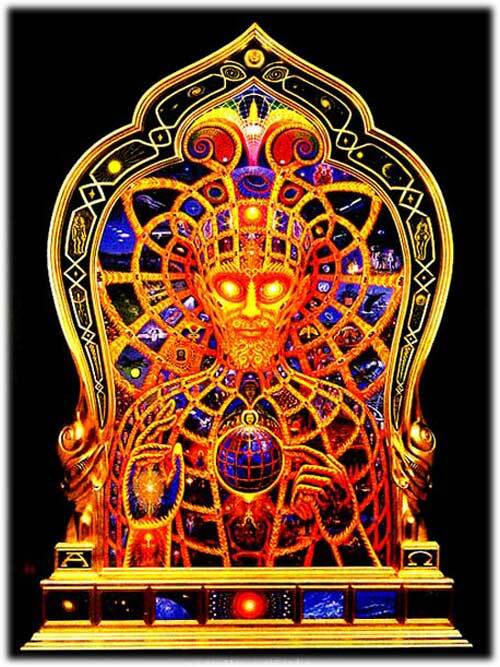 Artist Alex Grey’s mesmerizing Cosmic Christ; now we’re talking Gods! So there we have it. There actually IS reason to connect the winter solstice birth date of Isis’ Holy Child, Horus, with the traditional December 25th birth date of Mary’s Holy Child, Jesus. Yet, I don’t think early Christians “stole” the date from Horus (or any of the other solar Gods Who always were and always will be born on the winter solstice). Nor do I think the fact that the date has Pagan antecedents means Christianity was built on a lie or in any way denigrates Christianity, nor should we think that Christians merely copied their religion from the Pagans around them. For early Christians, as for ancient Egyptians—and indeed for both ancient and modern worlds—the return of the light at winter solstice is at once an uplifting environmental fact and a hopeful spiritual symbol. And so I wish you all Many Happy Returns of the Light on this holy day of December 25th. Addendum: I’ve reviewed my materials and confirmed that, yes—as you might expect from a sun-focused culture—the winter solstice was quite important in Egyptian culture and religion. There are plenty of inscriptions and texts to support that, and a number of temples and monuments are oriented toward the winter solstice sunrise, especially those dedicated to Re-Hor-Akhty, Re-Horus of the Horizon. Horus and ChristmasIsis and ChristmasThe meaning of ChristmasWhy December 25th? Thanks Isadora for this insightful article. Ockham’s Razor says that the simplest solution is usually the best solution. Given the similarities between the myth of Horus and Jesus it seems to me that explaining both myths as manifestations of the natural phenomena of the winter solstice is the most reasonable. But you are correct, there is no problem with celebrating the birth of Jesus on Christmas Day however there does exist evidence to support the belief that the mythology behind Jesus was constructed by his followers to attribute mythological powers upon him. I have read that Horus’ birthday (others say conception) was originally recognised on the 15th of November, so it is possible that they changed it to the winter solstice for the symbolism it would have. I’m not familiar with the Nov 15 date right off the bat, but I wonder whether it might be connected to the late Nov-early Dec festival during which Osiris is “lost” and “found” and if so, then Horus would have been conceived after His finding. You’re right that the early Christians didn’t choose the date of the 25th December. It was the Roman Emperor and the Catholic Priests in the 4th century AD. About the same time they were making up alot of other bull and throwing out parts of the Bible that didn’t suit their agenda. I think Hippolytus mentions “8 days before the calends of January” as the birth of the Christos. Do you have a reference for it as the birth of Horus? Would love to have a look if so! Thanks so much. Thank you so much for this post. It was fascinating to learn about Egyptian tradition from the later periods. There is only one slight problem… on the six day of phaophi is about the begging of October…. and the text should read “about the time of the winter solstice” not “on the winter solstice”… It is also recorded right after this, in the same writing, that the days of his birth where celebrated around the spring equinox. Thanks for the comment. I was using the Griffiths translations of Plutarch, which is usually pretty trustworthy, and he has “at the winter solstice.” The sacredtexts.com online version (William Charles King, 1908) has “about the time of the winter solstice.” Looking at the original Greek, the modifying word is “peri,” which is “about” or “around” the winter solstice. Any of these translations works to make the point of this post since we’re not talking about astronomical solstice, but when it was celebrated, which was about or around the solstice—when the lengthening days were just starting to be noticed. 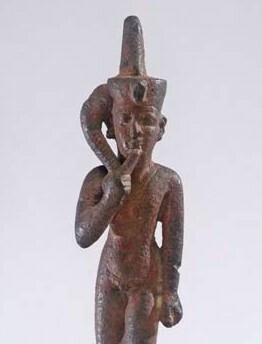 As always, we have to remember we’re talking about Deities here—Isis, Horus/Harpokrates, Jesus. Their timetables are not necessarily human ones and we human beings are always likely to connect Their comings and goings with symbolically important times to us; for instance, the winter solstice and spring equinox. Either would work symbolically well for Horus…it’s just that, in this case, we’re talking about the winter solstice. Perhaps I’ll do a post on His spring birth for the equinox! Your information on the birth of Horus markes sense. However, at the end noting you don’t think Christianity stole the date for the birth of Christ, you might be interested to do the same research on the accuracy of of that date as well. In fact, the Bible never mentions the date of his birth, so that date came from someplace else. Also, but what IS written is the fact that it was when shepherds were tending flocks in the fields at night, which they do in the fall, not December winter months. In addition, Christmas wasn’t even celebrated by early Christians, (the religion instituted by Jesus himself), not until the 3rd or 4th century, likely Church leaders chose that date to coincide with the pagan festivals already being held on or around the winter solstice. But no backing in the scriptures anyplace. Thank you for your research and thoughtful article. I thought it worth mentioning that Eastern churches, such as the Coptic Church, celebrate Christmas on January 7th.